.Sign up to get our FREE email news bulletins. Sorry, your Operating System is not able to use this application. News reports located on this page = 2. THE Unity Theatre is to collaborate with LEAF on Bold Street to bring a brilliant, immersive theatre show, which is set in a café, to Liverpool, from 22 April and 23 April 2019. 'User Not Found' is a production from Dante or Die, who specialise in site specific theatre, and is written by the celebrated theatre maker Chris Goode. 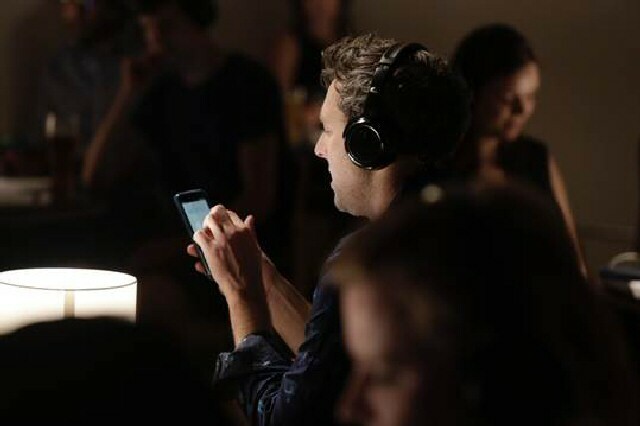 The show is a contemporary exploration of what happens to our digital identities after we die, experienced by audiences through smart phones and headphones. The Liverpool venues are joining forces for the 1st time to bring the Edinburgh Festival Fringe hit show to the Liverpool, over 22 April to 23 April 2019, with 2 performances on each date. User Not Found delighted audiences and won 4 and 5 star reviews from critics during its 2018 run at Edinburgh's Traverse Theatre. "It's the moment of your death. There's a magic button. Do you delete your entire online legacy? Or do you keep it; and leave the choice for someone else?" Terry and Luka were together for 9 years until Luka left Terry. Then Luka died leaving Terry as his online legacy executor. Through smart phones and headphones the audience becomes a fly on the wall to 1 man, faced with keeping or deleting. In a rapidly changing digital age, a story of contemporary grief unfolds through this intimate, funny performance that gently interrogates our need for connection and the fate of our digital afterlives. Gordon Millar, Artistic Director and CEO of Unity Theatre, comments:- "User Not Found was 1 of the standout shows for anyone fortunate enough to have seen it at the Edinburgh Festival in 2018. This April, Unity is delighted to present Dante of Die's insightful exploration of grief and connectivity. Taking place in the ever dynamic LEAF on Bold Street, this site specific performance inventively combines smart phones, exceptional writing and tender performance to unite audiences in a truly special, intimate experience." LEAF on Bold Street adds:- "We are thrilled to be working with Unity Theatre and Dante or Die to bring this remarkable piece of immersive theatre to our space. Both the history and architectural features of our building lend themselves to community experience and storytelling, and we couldn't be more excited by this upcoming partnership." Daphna Attias and Terry O'Donovan from Dante or Die add:- "After a brilliant Edinburgh Festival and UK tour in 2018, we're really excited to be bringing User Not Found to new audiences in 2019. It's great to be starting our tour with our 1st performance in Liverpool as a company and with this collaboration between Unity Theatre and LEAF on Bold Street. We can't wait to see what Liverpool audiences make of the show." User Not Found is the recipient of 'In Good Company's' mid career artist commission and was developed with the support of artsdepot's creative residencies:- Southbank Centre, University of Reading, South Street, The New Wolsey Theatre, Roundhouse London and Stone Nest. The project is funded by:- IMAF, AHRC, Cockayne - Grants for the Arts and The London Community Foundation, The Wellcome Trust Public Engagement Fund and Arts Council England. Unity Theatre has a strong track record of inspiring collaborations with producers and venues nationally and internationally. Recent successes have included the critically acclaimed:- 'Nina - A Story About Me and Nina Simone' with Riksteatern (Sweden's National Theatre Company) and 'Dead and Breathing' (with Ach 468 and The Albany in London). This spring, Unity collaborate with the multi award winning young peoples' theatre company:- '20 Stories High' and Theatre Rites, on 'Big Up,' a devised contemporary arts show for 3 to 6 year old's and everyone who looks after them. To see all the shows this year, at LEAF and also the Theatre, including show, book your tickets now or to find out more about it, click on to here now! 58% of 16-25 year olds in Merseyside say comparing their life to others on social media makes them feel:- "inadequate," while 59% think social media creates an:- "overwhelming pressure" to succeed. The 10th Prince's Trust Youth Index reveals UK young people's overall wellbeing score has flat lined at lowest level since study was launched The Prince's Trust is challenging young people's perceptions of success at a time of unprecedented opportunity for peer-to-peer comparison online by instilling confidence, and equipping them with the skills they need to be healthy, happy and safe. Published at a time when comparison with peers online seems inescapable for many young people, the report reveals that 54% of young people in Merseyside feel more anxious about their future when comparing themselves to others on social media. 41% of Merseyside young people worry that they will never be as happy as the people they see on social media and 12%:- "always" or "often" feel "panicked" when seeing the lives of their friends online. Sarah Gustafson, now 28, from Croxteth, Liverpool, always did well academically, culminating in a Master's degree in Fine Art, but has been debilitated by severe depression, anxiety and obsessive-compulsive disorder (OCD) for most of her adult life. "I also have ADHD and ASD (autism), meaning I find it really hard to concentrate and to form relationships with others. Because of this I struggled at university, not so much academically but emotionally. In many ways, my course and art were like a therapy for me, it's how I coped as I didn't receive a diagnosis until I was 24. At my worst, I didn't leave my room for four months. I lost my identity and I completely lost my confidence. 1 of the hardest parts was seeing old friends and people I went to School with being able to do everyday things on social media." Sarah picked up a flyer for The Prince's Trust when she was at university and, when it fell out of her bag 1 day, she decided to sign up. She joined The Trust's Enterprise programme, which helps unemployed young people to start their own business, with a view to setting up a mental health support and guidance resource in the future. Sarah commented that:- "I was absolutely terrified before starting as I didn't know where to begin with my idea. But straight away I received so much support. Everyone was so patient and understanding, which meant everything to me. I used to think that you have to show the best version of yourself on social media, but now I try to flip that on its head, telling people how I'm really feeling instead of trying to show a certain type of lifestyle. I have an online support group page on Facebook and Instagram called:- 'Mental health Diaries.' Here I show the reality of living with my conditions and it continues to help and support a lot of people struggling, as they see I can relate." The Youth Index, supported by eBay, is a national survey that gauges young people's happiness and confidence across a range of areas from their working life to physical and mental health. The latest report, based on an online survey of 2,162 young people across the UK, aged 16 to 25, has found that the overall Index score has flat lined at its lowest level in a decade at 69. The report finds that 53% of young people in Merseyside feel more confident online than they do in person. These figures come in parallel with findings that young people's confidence in their emotional health has dropped to its lowest level across the UK since the Index began, with a score of 64. Nick Stace, UK Chief Executive of The Prince's Trust, said:- "It appears that in the last 12 months nothing has happened to improve the way young people in Merseyside and across the UK are feeling about their lives. It is very sad to see the Youth Index score remain at its lowest level, and concerning that the considerable decline we saw in the Index last year has shown no recovery. Since the Youth Index launched a decade ago, social media has become omnipresent in the lives of young people and this research suggests it is exacerbating what is already an uncertain and emotionally turbulent time. Young people are critical to the future success of this country, but they'll only realise their full potential if they believe in themselves and define success in their own terms. It is therefore a moral and economic imperative that employers, Government, charities and wider communities put the needs of young people centre stage." The effects of social media on young people are still unclear, and 36% of Merseyside respondents claim that social media makes them feel like they can have a voice for their generation and influence positive change. 30% of respondents believe spending time on social media makes them happy. However, more popular responses included sport (51%), earning enough money to live how they want (68%) and spending time with family (78%). Rob Hattrell Vice President eBay UK, said:- "The decline in young people's wellbeing score in this year's Youth Index is very concerning. eBay continues to work closely with The Prince's Trust, building the confidence and skills of more young people to help them realise their full ambition and potential. The next generation is the future of our economy, so it's now more important than ever to ensure every young person is equipped to carve their own path to success." Methodology:- Survey participants are asked how happy and confident they are in different areas of their lives. The responses are then converted into a numerical scale, resulting in a number between 0 and 100, where 100 denotes participants being entirely happy or confident and zero being not at all happy or confident. The results for 2019 have been mapped against the data from the previous nine reports to give a high-level view of how the wellbeing and outlooks of young people have changed over time. Sorry your browser does not support the audio element on this page. This is just 1 of the events on our event calendar, click on here to see lots more! This online newspaper and information service is regulated by IMPRESS the independent monitor for the UK's press. Calls will cost 7p per minute, plus your telephone company's access charge. Calls to this number may be recorded for security, broadcast, training and record keeping. An Image from our Southport Webcam above. To see it live, please click on image. This is the current phase of the moon. For more lunar related information, please click on here. Southport and Mersey Reporter, 4a Post Office Ave, Southport, Merseyside, PR9 0US, UK. - Southport Reporter® is the Registered Trade Mark of Patrick Trollope.